Draft: 2008, New York Mets, 3rd rd. 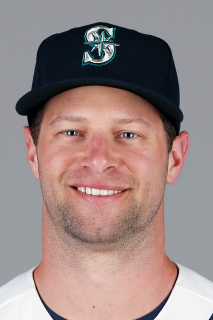 Kirk Robert Nieuwenhuis…resides in Bothell, WA with wife, Bethany… graduated fron Denver Christian (CO) High School…attended Azusa Pacific University, where he earned his degree in business management during the 2012 offseason. Began season with Milwaukee, earning a spot on an Opening Day roster…appeared in 16 games with Milwaukee, batting .115 (3x26) with 3 runs, 1 double, 1 home run and 1 RBI…designated for assignment on April 21…outrighted to AAA Colorado Springs on April 23…spent most of season with Colorado Springs, where he hit .244 (50x205) with 32 runs, 12 doubles, 4 home runs and 33 RBI in 84 games…rejoined Milwaukee on July 29 before being DFA'd on July 31 and outrighted to Colorado Springs Aug. 3. Batted .209 with 13 HR and 44 RBI in 125 games during his first season with Milwaukee...Made 92 starts (68g in CF, 22g in RF, 2g in LF)...Hit .290 at Miller Park (49-for-169, 11hr, 31rbi) and .127 (21-for-166, 2hr, 13rbi) on the road...Committed just 3 errors the entire season, all coming in right field on 7/27 vs. Arizona...Suffered an abdominal strain on 9/16 at Chicago-NL and appeared in just 1 game the rest of the season (PH on 10/2 at Colorado)...Signed a 1-year contract on 12/2, avoiding arbitration. Began the season with the Mets and batted .079 (3-for-38, 0hr, 2rbi) in 27 games before he was designated for assignment on 5/19.....made 6 starts (4g in LF, 2g in CF)…Was traded to LA of Anaheim on 5/27 in exchange for cash…Batted .136 (3-for-22, 0hr, 1rbi) in 10 games with the Angels.....made 6 starts (5g in LF, 1g in CF)…Was designated for assignment on 6/10 and claimed back off waivers by the Mets on 6/13…Was outrighted to Triple-A Las Vegas after being reacquired… Rejoined the Mets on 7/6 and batted .279 (19-for-68, 4hr, 11rbi) in 37 games the rest of the season.....made 15 starts (8g in CF, 5g in LF, 2g in RF)…Was on the 15-day disabled list from 8/2-8/31 with neck and left shoulder discomfort…Belted 3 HR with 4 RBI in the 5-3 win on 7/12 vs. Arizona.....became the first player in Mets history to produce a 3-homer game at home (10th Met overall)Smacked his first career pinch-hit homer on 9/8 at Washington, a solo shot in the eighth inning off Jonathan Papelbon, snapping a 7-7 tie in the Mets' 8-7 victory…Appeared in 4 games during the postseason, all off the bench…Was claimed off waivers by Milwaukee on 12/23. Had three different stints with the Mets, spending the rest of his season at Las Vegas (AAA) of the Pacific Coast League...Began the year with the 51s before the Mets recalled him on April 15...Optioned to Triple-A on May 1 and recalled on June 19...Optioned again on July 24 before returning for the final time on August 5...Started on April 15 and went 3-5 with a home run and three RBI...The last Met to have at least three hits, a home run and three RBI in his season debut was Carlos Beltran, who went 3-5 with a home run and three RBI at Cincinnati on April 4, 2005...The team went 18-4 (.818) in his starts...Hit .276 (21-76) as a starter...Eighteen of his 29 hits went for extra bases (14 doubles, one triple, three home runs)...Since 1901, only one other player has had as many hits in a season and as few singles (Adam Piatt, Tampa Bay and Oakland in 2003; 30 hits, 11 singles)...Became the first player in franchise history to collect a double in four straight at-bats, April 25-June 22...Collected his first game-winning RBI of the season on April 23 vs. St. Louis by drawing a bases-loaded walk...Also thew out the potential tying run at home plate in the ninth inning to preserve the 3-2 win...It marked the first time a Mets outfielder threw out the potential tying run at home in the ninth inning or later since May 23, 2003 vs. Atlanta when Tsuyoshi Shinjo ended the game by throwing out Chipper Jones at the plate...Went 8-28 (.286) as a pinch-hitter...Hit .339 (20-59) with runners on base...Made starts at all three outfield positions...Made 17 appearances, nine starts in left, 14 and 10 in center and six and three in right. Made his first Opening Day roster, making his season debut on Opening Day, April 1 as a pinch runner. Optioned to Las Vegas (AAA) of the Pacific Coast League on April 23, recalled on June 9 and optioned for a final time on July 26. Collected his first hit of the season as a pinch-hitter, April 5 vs. Miami. Snapped a 0-21 skid with a pinch-hit single, June 15. Hit .333 (5-15) with an RBI and one walk as a pinch-hitter. Hit his first game-ending home run (off Carlos Marmol), June 16 vs. Chicago (NL), a three-run shot to give to the Mets a 4-3 win..It was the first walk-off home run with the Mets trailing by two or more since August 30, 1992 (Bobby Bonilla vs. Cincinnati)...Also hit a home run (off Chaz Roe) on July 4 vs. Arizona to tie the game in the 14th inning, tying the latest game-tying home run in franchise history. Collected four hits, three runs, five RBI, two walks and a stolen base on July 5 at Milwaukee...Since 1921, no player in MLB history has had a game with as many hits, runs, RBI, walks and stolen bases....Without the stolen base, nine players since 1921 have had a game like that, most recently Colorado's Larry Walker, who had four runs, on June 25, 2004...Dave Magadan also did it with six RBI for the Mets on June 12, 1990. Became the first Mets players to reach base six times in a nineinning game (July 5) since Mike Piazza on May 27, 2000...His five RBI were a career-high. Had two home runs and three RBI at Fresno on June 4. Hit a home run in four straight games, May 24-May 27 at Las Vegas. At Las Vegas, had 12 two-hit games and two three-hit contests...Hit .248 (70-282) with 14 home runs and 37 RBI in 74 games for the 51s. Played one game for Buffalo (AAA) of the International League before hewas recalled by the Mets to replace Andres Torres who was injured in theseason opener on April 5...Was optioned back to Buffalo on July 29...On August 3 at Syracuse, sustained a partial tear of the plantar facia of theright foot in game...Surgery was not required but he did not play theremainder of the year...Made his major league debut with a start in rightfield April 7 vs. Atlanta...Went 2-4, singling against Jair Jurrjens in the fourth inning for his first hit...Collected his first home run, a two-run shot, in the fourth inning vs.Washington (off Edwin Jackson) on April 9...Became the first lefthanded Mets batter to hit an opposite field home runover the wall at Citi Field on April 20 vs. San Francisco (off Barry Zito)...Hit another one June 23 vs. the Yankees (off Ivan Nova)...Collected his first career walk-off RBI with an RBI single off Miami's HeathBell in the ninth inning on April 26, giving the Mets a 3-2 win...Led all major league rookies with a .325 batting average and 26 hits inApril...His .325 batting average was the third-highest by a rookie in teamhistory in the month of April...Belted two home runs on June 14 at Tampa Bay (off Jeremy Hellickson), hisfirst career- multiple home run game...Hit another home run on June 15vs. Cincinnati (off Bronyson Arroyo), his first career streak of home runsin consecutive games...Became the third rookie in team history to hit twohome runs from the leadoff spot on July 14 at Tampa Bay...Made starts in all three outfield positions (43 in center, 20 in left and six inright) and hit leadoff, two, five, six seven and eight in the starting lineup...Compiled a .325 (26-80) batting average in 22 April games...For the season, he hit .271 (60-221) vs. righthanded pitching...Had 11, two hit games and five, three hit contests on the season...Went 3-5 with a home run and career-best three RBI vs. St. Louis on June3...Also had three RBI on June 14 at Tampa Bay. Appeared in 53 games with Buffalo (AAA) of the International League before a shoulder injury cut his season short...Suffered a left shoulder strain on June 9 while swinging...Placed on the Disabled List on June 10 and missed the rest ofseason...Had shoulder surgery to repair a torn labrum in his left shoulder on July 11...Finished second on the Bisons in extra-base hits (25) and third in doubles...Reached base in the first 20 games of the season...That span included a season-high 16-game hitting streak from April11-April 26 (.382, 21-55). Spent the majority of the year with Binghamton (AA) of the Eastern League...Was promoted to Buffalo (AAA) of theInternational League on August 5...Captured the Sterling Award at Binghamton, symbolic of the team's MVP...Named the EL's Player of the Week, July 5-July 11...Hit .469 (15-32) with six doubles, two home runs and six RBI...Selected to the league's All-Star Game, which was played on July 14 at Metro Bank Park in Harrisburg, PA and went0-2...For Binghamton, he hit .319 (29-91) in 20 games during April...Also batted .328 (38-116) in 28 July contests with 16doubles, six home runs and 17 RBI...Went 5-6 with four runs scored, two doubles, a home run and four RBI at Portland on April 20...Had two, four-hit games, July 3 vs. Portland (4-5) and July 6 at Altoona (4-4)...In addition, he had 20 games with twohits and nine contests with three hits...For the season at Double-A, he compiled a .316 (31-98) batting mark with men in scoring position...Compiled a .338(22-65) batting mark with runners on and two outs...Knocked in six runs vs. New Britain on June 5...Hit safely in 10 straight games July 3-July 12 (24-47, .511)...Had six-multiple hit games with Buffalo: four, two-hit contests and two, three-hit games. Won the Sterling Award, emblematic of the Most Valuable Player at St. Lucie(A) of the Florida State League...Named to the FSL All-Star team and led the league in doubles, sluggingpercentage, extra-base hits (56) and runs scored...Also ranked third in homeruns...Joined Binghamton (AA) of the Eastern League on August 31st...Had four hitsvs. Bowie on September 2nd...Ranked 10th in all of minor league baseball with 99 runs scored...At St. Lucie, he hit .345 (40-116) in 27 games in August...Had 13 doubles, twotriples and six home runs...Also with St. Lucie, he registered 35 multiple-hit games; 28 games with two hits,four games with three hits and three games with four hits: August 22nd vs.Sarasota, August 24th vs. Fort Myers and August 28th vs. Palm Beach...Knocked in four runs three times: July 9th vs. Palm Beach, August 4th andAugust 20th, both vs. Sarasota...Put together a 15-game hitting streak from July 19th-August 4th...Hit .322(19-59) during that span...Hit safely in 83 of the 123 games he played at St. Lucie and in seven of the eightgames he played at Binghamton. Played for the Brooklyn Cyclones (A) of the New York-Penn League and tied thefranchise record for hits...Led the Cyclones in almost every offensive category: games, at-bats, runs,doubles, triples, extra-base hits (23), RBI and stolen bases. August 2, 2018 Tacoma Rainiers released RF Kirk Nieuwenhuis. April 2, 2018 RF Kirk Nieuwenhuis assigned to Tacoma Rainiers. January 16, 2018 Seattle Mariners signed free agent RF Kirk Nieuwenhuis to a minor league contract and invited him to spring training. October 2, 2017 RF Kirk Nieuwenhuis elected free agency. September 6, 2017 RF Kirk Nieuwenhuis assigned to Biloxi Shuckers from Colorado Springs Sky Sox. August 3, 2017 Milwaukee Brewers sent RF Kirk Nieuwenhuis outright to Colorado Springs Sky Sox. July 31, 2017 Milwaukee Brewers designated CF Kirk Nieuwenhuis for assignment. July 29, 2017 Milwaukee Brewers selected the contract of CF Kirk Nieuwenhuis from Colorado Springs Sky Sox. July 19, 2017 Colorado Springs Sky Sox activated CF Kirk Nieuwenhuis from the temporarily inactive list. July 15, 2017 Colorado Springs Sky Sox placed CF Kirk Nieuwenhuis on the temporarily inactive list. April 23, 2017 Milwaukee Brewers sent CF Kirk Nieuwenhuis outright to Colorado Springs Sky Sox. April 21, 2017 Milwaukee Brewers designated CF Kirk Nieuwenhuis for assignment. December 23, 2015 Milwaukee Brewers claimed CF Kirk Nieuwenhuis off waivers from New York Mets. September 1, 2015 New York Mets activated LF Kirk Nieuwenhuis from the 15-day disabled list. August 17, 2015 New York Mets sent LF Kirk Nieuwenhuis on a rehab assignment to Las Vegas 51s. August 13, 2015 New York Mets sent OF Kirk Nieuwenhuis on a rehab assignment to St. Lucie Mets. August 2, 2015 New York Mets placed LF Kirk Nieuwenhuis on the 15-day disabled list retroactive to July 30, 2015. Pinched nerve in upper back. July 6, 2015 New York Mets selected the contract of LF Kirk Nieuwenhuis from Las Vegas 51s. June 16, 2015 Las Vegas 51s activated CF Kirk Nieuwenhuis. June 15, 2015 New York Mets sent CF Kirk Nieuwenhuis outright to Las Vegas 51s. June 13, 2015 New York Mets claimed CF Kirk Nieuwenhuis off waivers from Los Angeles Angels. June 10, 2015 Los Angeles Angels designated CF Kirk Nieuwenhuis for assignment. May 28, 2015 Los Angeles Angels activated CF Kirk Nieuwenhuis. May 27, 2015 New York Mets traded CF Kirk Nieuwenhuis to Los Angeles Angels for cash. May 19, 2015 New York Mets designated CF Kirk Nieuwenhuis for assignment. August 5, 2014 New York Mets recalled CF Kirk Nieuwenhuis from Las Vegas 51s. July 24, 2014 New York Mets optioned CF Kirk Nieuwenhuis to Las Vegas 51s. June 19, 2014 New York Mets recalled Kirk Nieuwenhuis from Las Vegas 51s. May 1, 2014 New York Mets optioned CF Kirk Nieuwenhuis to Las Vegas 51s. April 15, 2014 New York Mets recalled Kirk Nieuwenhuis from Las Vegas 51s. March 24, 2014 New York Mets optioned CF Kirk Nieuwenhuis to Las Vegas 51s. September 30, 2013 New York Mets recalled Kirk Nieuwenhuis from Las Vegas 51s. July 27, 2013 New York Mets optioned Kirk Nieuwenhuis to Las Vegas 51s. June 9, 2013 New York Mets recalled Kirk Nieuwenhuis from Las Vegas 51s. April 23, 2013 New York Mets optioned Kirk Nieuwenhuis to Las Vegas 51s. October 4, 2012 New York Mets recalled Kirk Nieuwenhuis from Las Vegas 51s. September 29, 2012 Kirk Nieuwenhuis roster status changed by Las Vegas 51s. August 5, 2012 Buffalo Bisons placed CF Kirk Nieuwenhuis on the 7-day disabled list retroactive to August 4, 2012. July 30, 2012 New York Mets optioned CF Kirk Nieuwenhuis to Buffalo Bisons. April 6, 2012 New York Mets recalled Kirk Nieuwenhuis from Buffalo Bisons. March 15, 2012 New York Mets optioned Kirk Nieuwenhuis to Buffalo Bisons. November 18, 2011 New York Mets selected the contract of Kirk Nieuwenhuis from Buffalo Bisons. September 22, 2011 Kirk Nieuwenhuis roster status changed by Buffalo Bisons. June 10, 2011 Buffalo Bisons placed CF Kirk Nieuwenhuis on the 7-day disabled list. February 14, 2011 New York Mets invited non-roster CF Kirk Nieuwenhuis to spring training. October 8, 2010 CF Kirk Nieuwenhuis assigned to Mesa Solar Sox. August 5, 2010 CF Kirk Nieuwenhuis assigned to Buffalo Bisons from Binghamton Mets. February 4, 2010 New York Mets invited non-roster CF Kirk Nieuwenhuis to spring training. August 31, 2009 Kirk Nieuwenhuis assigned to Binghamton Mets from St. Lucie Mets. April 9, 2009 Kirk Nieuwenhuis assigned to St. Lucie Mets from Brooklyn Cyclones. June 11, 2008 New York Mets signed CF Kirk Nieuwenhuis.